Fees associated with filing industrial design applications in Germany as well as other design fees are available in the fee calculator. Multiple design applications (up to 100 designs if they have at least one common class of goods) are possible in Germany. The following information should be provided for the successful filing of a design application: a request for registration, applicant’s and designer’s details, a representation of the design and indication of the class(es) of goods in which the design is to be classified. The copy of the Priority Document must be submitted within 16 months from the date of priority. Industrial designs in Germany undergo formal examination only. The substantive examination procedure of the design applications in Germany is not stipulated. 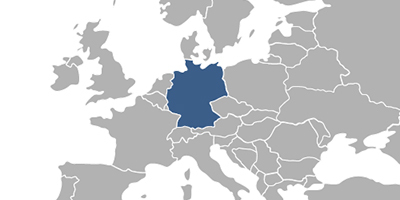 The novelty grace period in Germany constitutes 12 months prior to the filing date or priority date. If the application became available to the public by the designer or his successor in title or by a third party as a result of information provided or action taken by the designer or his successor in title or if the design was disclosed as a consequence of an abuse in relation to the designer or his successor in title within the above-said period, it does not disprove the novelty of the design in Germany. The official grant fee is not stipulated. Validity term of the patent for an industrial design in Germany constitutes five years as of the filing date. This term may be renewed four times up to a maximum of 25 years. Renewal fees may be paid before the end of each protection period. The processing time from the filing to registration is approximately 2-4 weeks in case of smooth registration procedure. For a person neither residing in Germany nor having a principal place of business nor an establishment in Germany, it is necessary to perform the industrial design prosecution through a patent attorney or lawyer entitled and authorized to represent him in proceedings before the German Patent and Trade Mark Office. 1. Online Search databases: German Industrial Designs, Community Designs (EUIPO), International Designs. 2. Industrial design protection in Germany may also be obtained via registration of a Community Design.